Growing public and commercial infrastructures, upcoming FIFA World Cup 2022, and increasing IT spending are some of the key few factors that have spurred the market for electronic security in Qatar. The country is also citing increase in demand for various electronic security equipment owing to rise in hospitality, and retail sectors. In Qatar's electronic security market, video surveillance segment accounted for majority of the market revenues; IP surveillance systems witnessed significant growth in installations across various applications such as government & transportation, commercial offices, and retail vertical. According to 6Wresearch, Qatar's electronic security market is projected to grow at a CAGR of 15.2% during 2015-21. In 2014, video surveillance systems have accounted for majority of market share in the overall market. In application market, government & transportation, commercial offices and retail & logistics cumulatively held lion share in overall market. The report thoroughly covers the market by surveillance types, applications and regions. The report provides detailed analysis of the on-going trends, market drivers and competitive landscape. 13.3	Hangzhou Hikvision Digital Co. Ltd.
13.7	Samsung Techwin Co. Ltd.
13.10	Lenel Systems International, Inc.
Qatar is one of the rapid growing economies amongst GCC countries. On account of growing construction market, strengthening IT infrastructure, growing security spending along with intensifying security concerns, Qatar witnessed increase in deployment of various electronic security systems. In Qatar electronic security market, video surveillance segment are recording higher growth than access control systems, owing to government regulation concerning IP/Network surveillance systems. 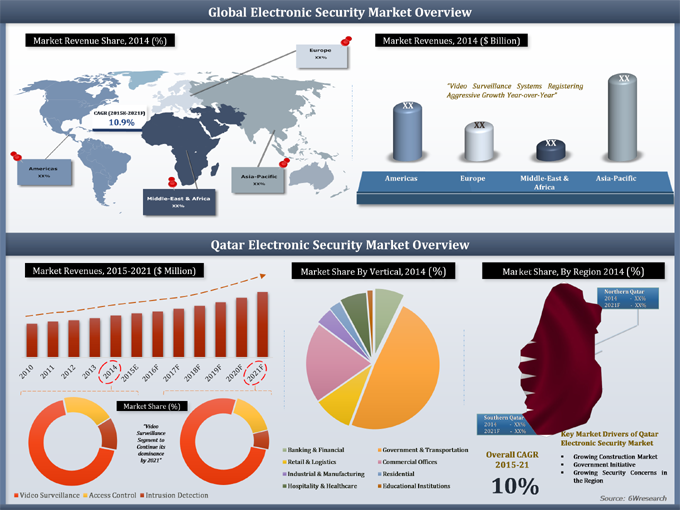 The major companies in Qatar's electronic security market include- Axis Communications, Bosch Security Systems, Hikvision, Honeywell, Pelco by Schneider Electric, Lenel Systems, Fingertec, HID Global, Samsung Techwin, Siemens WLL and Tyco Qatar.